As spacecraft re-enter the earth’s atmosphere, there is one major piece of equipment that protects astronauts from the onslaught of hot gases that surround the vehicle: its heat shield. When the spacecraft hurtles through the atmosphere, the heat shield is designed to ablate, or erode away, as outer layers of the shield material are turned into a gas that takes the heat with it and leaves the rest of the material behind. 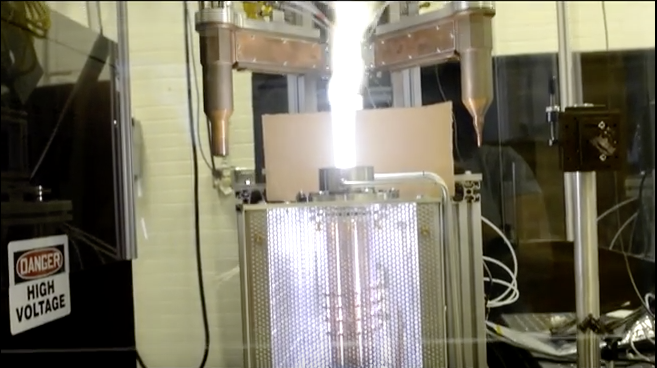 It is not fully understood how well different heat shield materials hold up against the brutal re-entry process — this is where Texas Engineers come in. Led by Noel Clemens, chair of the Department of Aerospace Engineering and Engineering Mechanics in the Cockrell School of Engineering, and Philip Varghese, director of the school’s Center for Aeromechanics Research, UT Austin engineers—including graduate and undergraduate students—are using a newly installed plasma torch to help NASA determine exactly how different heat shield materials will react to the very hot gases that spacecraft will encounter upon re-entry. Such research will hopefully provide data that will inform future space travel to other bodies in the solar system and beyond. The Cockrell School of Engineering at UT Austin: Educating future engineering leaders. Developing innovative solutions. Improving lives throughout the world. A peek behind the doors into the world-changing research happening at the Cockrell School.